Steph Su Reads: Blog Tour Author Interview: Lindsay Eland! Welcome to the blog tour for Lindsay Eland's debut novel, Scones and Sensibility! The previous blog tour stop was at In BetweeN the Pages. Earlier today I reviewed Scones and Sensibility; now, I am happy to share with you an interview with the author herself! Welcome, Lindsay, to Steph Su Reads! 1. How is Polly similar to you? How is she different? Polly and I are very similar. I am also overly-dramatic and overly romantic, and I too would love to go back and live in Regency England, though I’d have to take deodorant with me along with my espresso machine and the ability to create electricity so that I could make it work. But on the other hand, we are also very different. I’m not nearly as confident as she is, and would never ever presume that I could make successful matches for people though I like to think that I could. And also, my hair is just too short to put a ribbon in and I’d look more like a girl-with-super-short-hair-trying-to-act-like-she-had-super-long-hair…which, of course, is exactly what I’d be doing. 2. Polly's relationship with her older sister, Clementine, is an important aspect of your book. Is it based on your own relationship with any siblings? I have two sisters, one older and one younger who I adore with all my heart. But I would say, that my relationship with my older sister, Alisa, probably resembles Polly and Clementine’s most. She was two years older than me, going through a lot of things before I was even ready to think about them. 3. What is your favorite kind of baked good? 4. Describe for us one of your own childhood "Anne Shirley" moments. In fifth grade, my best friend Bekka and I watched the Anne of Green Gables series together and then proceeded to act a lot of the scenes out…even meeting together in a secret place we unromantically named “The Fort” and exchanged locks of hair with each other. 5. Who are your top 3 literary crushes? Mr. Darcy, Mr. Rochester, and I can’t help myself…Edward Cullen…even if he is always cold. 6. What advice would you give an 11-year-old about the ups and downs of being 12? Embrace every moment, always have hope, and be completely yourself no matter what that may look like. Oh, and always save enough room for dessert! 7. If you could learn how to do one thing masterfully well, what would it be, and why? Hmm, it would either be to bake anything and everything perfectly-perfect, 'cause up here in the high altitude my poor cakes tend to sink and my breads are hard as rock. I’d also like to be a professional ballet dancer. 8. Can you give us a little hint of what's next for you in terms of writing? I recently turned in my second contracted book for Egmont USA to my editor, about a shy, introverted girl who learns to find and embrace her inner strength and confidence. As of right now it will be released next spring! And for the more culinary talented or curious of us, why don't you try out Lindsay's favorite scone recipe, which is below? 1. Preheat oven to 375 degrees and line baking sheet with parchment paper or aluminum foil. 2. Whisk the flour, sugar, baking powder together in a large bowl then cut in butter with a pastry blender or two knives. Stir in chocolate chips. 3. In a separate bowl whisk buttermilk, egg, and vanilla together. Drizzle over the flour mixture and stir with a fork until dough comes together. 4. Turn onto a floured work surface and knead a few times then pat dough into a 1-inch thick circle. 5. Cut into triangles, brush with egg wash, and then sprinkle with cinnamon and sugar. 7. Optional: Turn oven to broil and then dust with powdered sugar and broil for a few minutes...watch carefully though so the sugar doesn't burn. Thanks so much for the answers and recipe, Lindsay! Please check out the next stop on the Scones and Sensibility blog tour, which will take place over at Tales of Whimsy! Wonderful interview! I really loved this blog tour. Very nice interview! I first heard about this book a few weeks ago and thought it was really cute. Really fun interview! Lindsay seems like a really good-natured, cool person. :) Love that scone recipe, too -- has my mouth watering! What an interesting interview! 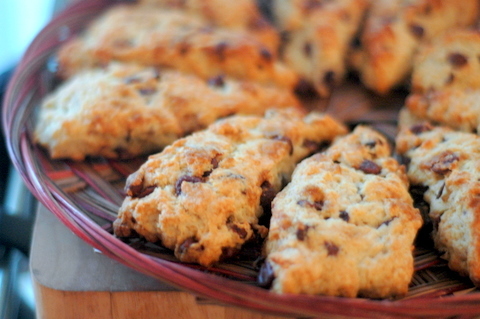 I love the questions you asked and I love that she included a scones recipe! I haven't read this one yet but it is another adaptation that I want to read.